Objective: The client Fast and Easy Home Buyer wanted to create a website to allow home owners facing foreclosure to easily sell their homes for cash. The website allows home sellers to easily find and get cash for their homes in the event that they need to sell their home. Fast and Easy Home Buyer is located in Palm Beach Gardens Florida and they buy homes through out South Florida in Palm Beach County, Martin County, Port Saint Lucie, Broward County. 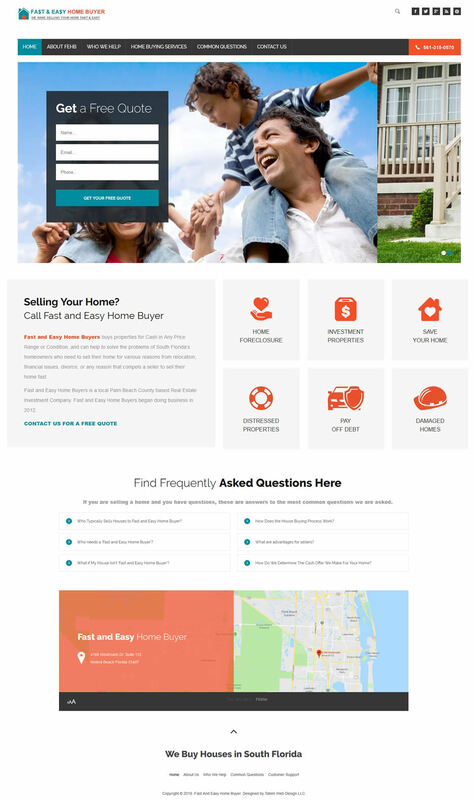 Tatem Web Design created an expandable CMS content management system to be able to encompass the many services that Fast and Easy Home Buyer offers to home owners. The client supplied the logo and the companies colors to create the new website. The CMS system is fully expandable and the new website is being used daily to allow home sellers and easy resource to sell their homes. Tatem Web Design LLC. is also doing the search engine optimization for the client to make sure that they are getting plenty of business leads through the website and that they have good propoer placement on the Major search engines We setup the clients hosting, email, and website marketing and promotion. We manage the website, the web hosting, the SEO, and Fast and Easy Home Buyer's website support.